Pros: Great to see a strong script wrought from the stories of real people. Cons: Having everyone play the main character had an alienating effect. A good, solid production that lacks a bit of edge. 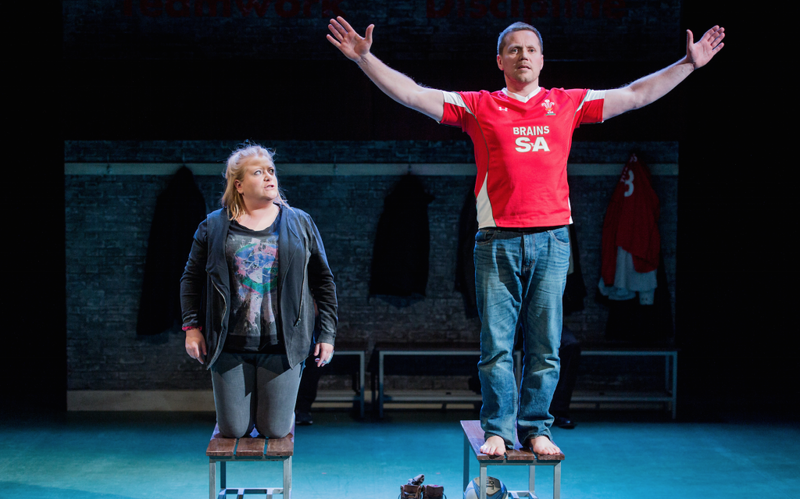 Crouch Touch Pause Engage tells the story of Welsh Rugby legend Gareth ‘Alfie’ Thomas, and his struggle to come to terms with his sexuality. Alfie’s story is counterpointed by those of two teenage girls from his home town, Bridgend, who are fighting similar, though less high profile, battles. Whilst it was undeniably good, it had me struggling to feel anything much more than admiration. Mostly, it was impossible not to admire the slickness with which the cast switched between characters, passed a rugby ball around the small stage, sang, timed their dialogue and performed passages of physical theatre. The back wall of the set was made up like a changing room, and there can hardly have been a minute when one or other of the actors was not stood quietly at the back wall, slipping out of one shirt and into the next. The play is based on interviews with Alfie himself, and with young people from Bridgend. I don’t think it claims to be verbatim theatre, but it nevertheless has to walk that line between authenticity and imitation, between fidelity and entertainment, and it takes three different approaches. Alfie is played by all six actors, in addition to their other roles. His parents, Baz and Vonnie, are played consistently by Rhys Ap William and Bethan Witcomb, whilst the teenage girls, whom I assume are composite characters, but in any case not recognisable to Joe Public, are likewise played throughout by the same actresses. I can see why it was attractive to have Alfie played by multiple actors (none of whom bear any resemblance to him). It meant skirting the pitfalls of impersonation, and gave enough distance for a bit of dramatic licence. But for me, that distance really reduced the emotional impact of the main story. And whilst Baz and Vonnie were played as the proud, loving and lovable parents that I’m sure they are, they also served in the play as a kind of comedy double act who finished each other’s sentences and worried about the dog eating the laundry. They responded to their son’s distress with a sort of cheerful, light anxiety that made me wonder just how faithful a portrayal it really was. In a field of splendid performances, Lauren Roberts, as Darcy, really stood out for me. Darcy delivers some of the play’s darkest material, as she describes the voices in her head that spur her to self-harm and attempt suicide. But her tone is one of rueful nonchalance; the Darcy that emerges from trial by mental illness has gained a much-needed sense of purpose and self-worth, but lost none of her gobby bravado. Speaking as someone unqualified to judge, being remote from both Wales and teenagedom, everything about the character of Darcy seemed recognisable and respectful. 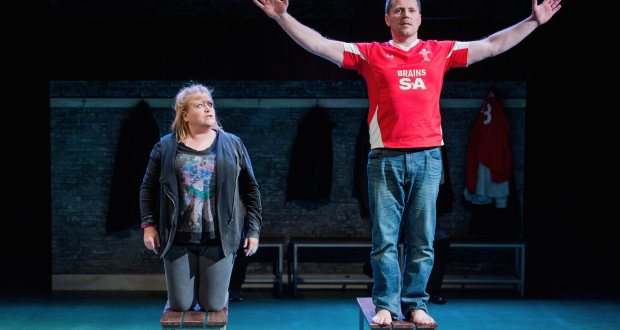 I had very high expectations of this play, having been blown away by Out of Joint’s 2014 touring production, This May Hurt A Bit, which also tackled social issues and featured a grandstanding Welsh politician. But where that play had me laughing out loud, and there was even an outside chance of tears, this one just raised a chuckle. That play was out and proud performance that managed to be opinionated but still warm. This one was funny and affectionate, but perhaps a bit too soft around the edges. Whilst it was delightful to see Meryl and Darcy come good, I did wonder if they were the exception or the rule in today’s Bridgend. It was equally delightful to see how readily friends and colleagues accepted Alfie’s sexuality and understood his past duplicity. But the play offered no judgement about how things might have been different had he come out at seventeen. I suspect Alfie himself has a view on that. Previous: RE:act. 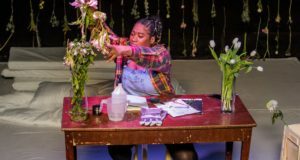 London’s newest playwriting programme.